If you have been on social media lately, you must have noticed that Marie Kondo has been the talk of the town. The Japanese organizing consultant has been promoting the importance of tidying up and decluttering, inspiring people to practice what she calls the KonMari method. While it sounds pretty simple, it turns out that neatness can make a good difference for a lot of us — not just in terms of appearance but even when it comes to your physical and mental health. Darby Saxbe, Ph.D., assistant professor of psychology at the University of Southern California, says that the physical act of cleaning up and setting things in order can be therapeutic. By taking control of our surroundings, cleaning can be “an escape” when we are overwhelmed by things like work or technology. 1. 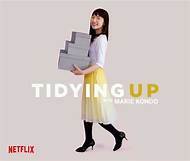 Marie Kondo’s method of tidying is partly inspired by Shinto religion, which is concerned with the energy or divine spirit of things. How much do you know about Marie Kondo and her method? 2. What is your method of cleaning and tidying? Do you practice the concept of “spark joy”?